After successful introduction of all-electric injection moulding machines from JSW (Japan Steel Works Ltd) in Germany in 2007 and continuous market penetration in the past nine years, WINDSOR Kunststofftechnologie GmbH in Hanau now makes a further step. As a renowned system supplier, it is now presenting for the first time at K 2016 the well-known FCS (Fu Chun Shin Group, Tainan, Taiwan) brand injection moulding machines. WINDSOR is thereby extending its injection moulding offer into hydraulic and servo-electric drive machines. A larger market area is now covered by the FCS machines, in EU and EFTA countries in the European Economic Area (EEA). 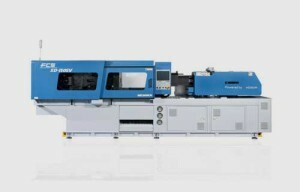 WINDSOR and FCS demonstrate in Hall 12 the performance of the servo-hydraulic drive SD-150SV machine (1.500kN clamping force) in production of a transparent assortment box in polypropylene. FCS is a machinery producer with a 40-year heritage that has developed since 1974 into the largest injection moulding machine producer in Taiwan, as a public company with a stock exchange listing for its shares. With around 500 employees, FCS also produces high-end, multi‑component injection moulding machines, as well as rubber and thermosetting plastic compression moulding machines in its headquarters plant in Tainan, Taiwan. Due to due to capacity restraints, standard hydraulic machines between 300 and 37,000 kN clamping force are produced in two plants on the Chinese mainland. Through introduction of a strategy for strong sales expansion, FCS Group wants to rise up to become one of the worldwide top ten injection moulding machinery producers in the medium term, as a company with capacity well exceeding of 1,500 machines per annum. Contract with FCS: Fu Chun Shin Group (FCS), Taiwan, and WINDSOR Kunststofftechnologie GmbH in Hanau, Germany signed an agreement in July 2016, under which FCS has committed to construct and supply hydraulic and servo-hydraulic injection moulding machines (abbreviation: IMMs) according to European standards and specifications as prescribed by WINDSOR. In return, WINDSOR acquires, based on its established sales network developed over 65 years, responsibility for long-term sales, trading, installation, replacement parts supply and service for these 300 to 37,000 kN clamping force IMMs in all EU and EFTA countries belonging to the European Economic Area (EEA). Both companies agreed to close cooperation in further technical development of FCS machines for the European market. Erich Gaube, Sales Manager at WINDSOR says: “Demand for injection moulding machines in the EU and EFTA amounts, according to conservative estimates, to 10,000 units per annum. With the extended product offer, we address processors who have no resentments towards high-tech injection moulding technology originating in Asia, but who keep an eye on low investment and overall product costs”. FCS fair exhibit: For the first time, FCS and WINDSOR present themselves jointly in Hall 12 on Stand B11 at K2016, where they show a new SD-150SV servo-hydraulic toggle clamping injection moulding machine with 150 tonnes (1,500 kN) clamping force, 1,010 mm space (“daylight”) between the 670 x 670 mm platens, 130 to 550 mm mould mounting height, 460 x 460 mm tie-bar clearance, 40 mm screw diameter, 251 cm³ injection volume, 1,785 bar injection pressure, 125 mm/s injection speed and 15kVA electrical power supply rating. This IMM offers the processor highly efficient and profitable moulding with low energy consumption for an almost unlimited range of applications in terms of industries and products, while using all conventional polymers, right up to the latest super-performance engineering plastics. It is characterised by high precision and repeatability, high speed, long life, endurance and especially energy efficiency. But this innovative IMM from Taiwan is above all impressive on account of its extremely attractive price/performance relationship. The SD-150SV is just one of 18 differently sized machines with clamping forces ranging from 30 to 142 tonnes that are presently on offer in the servo‑hydraulic area. Relevant product highlights: A small transparent polypropylene PP-MINI assortment box for holding small items used in manual work (e.g. needles, thread, buttons or screws, nails, insulation tape) is moulded at K 2016 in a single-cavity 440 x 440 x 400 mm (LxWxH) mould from Hünersdorff Kunststoffverarbeitung GmbH in Ludwigsburg, Germany. The PP-MINI box has shot weight 150 grammes, measurements of 140 x 180 x 40mm (LxWxH) and 1.6mm wall thickness. Its transparent, glossy appearance is obtained with use of polypropylene from Slovnaft (MOL Group) in Slovakia, together with a ClearTint colour masterbatch from MILLIKEN Europe. A LDM1-CE volumetric screw-feeding hopper loader dosing unit from Main Tech Srl in Mellaredo di Pianiga (VE), Italy, mixes the PP granulate and masterbatch materials before dosing the mixed materials to the injection moulding machine’s plastification unit. A S3 linear drive picker robot from SEPRO handling unit removes the open box – which consists of two halves with an integral moulded film hinge – from the mould, places it on a conveyor belt and closes the box halves via its two integrated click-closing snap-fit fasteners. Precise and synchronous movements of all relevant axes and repeatable parallel functions guarantee excellent production conditions, gentle treatment of the material and tool, as well as shortened cycle times while simultaneously obtaining optimal part quality. The 32-bit control technology from KEBA AG in Linz, Austria, equipped with a 12“ touchscreen monitor, enables relevant process parameters to be recorded and optimised, should this be required. The control system communicates via all Euromap interfaces, integrating all possible ancillary equipment with the IMM. Proportional integral derivative (PID) temperature control takes place with use of solid state relays (SSR). Superior machine performance comes together with attractive performance data and low electrical connection load. The energy-optimised 1,500 kN clamping force SD-150SV machine on display at K 2016, for example, has a low electrical power supply rating requirement of only 15kVA. Fully hydraulic exhibit: FCS also exhibits a 1,600 kN clamping force FB160RV multi-component machine on the WINDSOR fair stand at K 2016. The standard range model is a suitable choice in particular for production of mass products in most highly different materials in tools with a large number of cavities and with fast cycle times, especially on account of its optimised price/performance relationship. Production of brushes in two different materials and colours is demonstrated on the two-component version of this machine at K 2016.